London City Airport is the only airport actually located in London and is conveniently less than a mile from the ExCeL Centre. For European travelers, this is the ideal airport to fly in and out of for ICE. Heathrow airport is so large it actually has five (5) separate terminals. Make sure you know from which terminal your flight will land or depart. The Paddington Line tube station serves Heathrow with the Heathrow Express, and the trip takes only 15 minutes. Several airlines now offer the option of checking in for your outbound flight at Paddington station before boarding the train to the airport. The Express serves all four Heathrow terminals. For Non-UK residents, you can book your London Heathrow Express tickets in advance and if you are only traveling between Terminals 1, 2, and 3, Heathrow Express offers a free shuttle. Piccadilly line tube serves all terminals, and is the way to go if you are budget-minded. The trip takes an hour, and tickets are available at the luggage area. You’ll need the all-zone ticket (or the all-zone Travelcard). Several large hotel chains have a "presence" at Heathrow. You can get to these hotels by using the Hotel Hoppa Bus. Alternatively, National Express dot2dot operate shuttles from both major London airports to hotels in the city, for about half the price of a taxi. Prices start from US $17.50 per person, with additional discounts for large groups. A popular alternative is to use an airport transfer service such as TaxiReservations, which will drive you direct to most popular city centre hotels. If budget is not an issue, the simplest option for transportation into the city from Heathrow is one of the traditional black London taxis. Private Hire Companies often add a waiting time/Car park surcharge to fares and black cabs charge more at night. Gatwick is smaller than Heathrow with only two (2) terminals, connected by a monorail service. It is also much easier to drive in and out of - especially for foreign visitors not used to driving on the left. Gatwick Express runs very frequent shuttle trains to/from Victoria Station. 05:00 to midnight trains run every 15 minutes. The trip takes about 30 minutes, and is quite reasonably priced (by UK standards!). You can buy tickets here for the Gatwick Express. There are also Thameslink trains from London Bridge, Farringdon and King's Cross. In this case, cheap transport isn't that big a savings. Connex South Central trains run to/from Victoria. A better deal is the Flightline bus, with a ticket good for 3 months. Flightline. Again if budget is not an issue, consider black taxi, or a slightly cheaper minicab. Alternatively, National Express dot2dot operate shuttles from both major London airports to hotels in the city. Or, use an airport transfer service like TaxiReservations, and get dropped off at your hotel. London has one of the largest urban transport networks in the world. Getting around can be easy whether it be by taxi, tube, bus, train or waterway. It is the gateway to Europe and the most accessible city in the world. As the world’s busiest international business hub, London can be reached by more people, from more destinations, in less time than any other city in the world. The DLR is part of the London Underground network. Two of the stations, Custom House and Prince Regent are on the ExCeL Campus. Trains pull up at a covered walkway leaving visitors with less than a two minute walk to the entrance. Service is fast and frequent, DLR runs 12 trains an hour to Beckton. 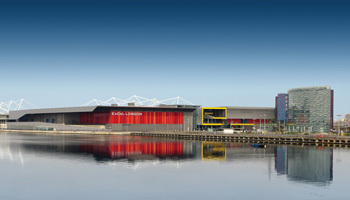 ExCeL London is located in Zone 3. For ICE 2017 – the West Custom House Station will be closed. ONLY the East Prince Regent entrance will be accessible. The Jubilee Line and the DLR are the quickest routes to ExCeL London. Alight at Canning Town on the Jubilee Line and the change onto a Beckton-bound DLR train for the quick stop journey to ExCeL to the Prince Regent at the ExCeL. The London Overground, part of the London Underground network, serves a large part of the Greater London and parts of the Hertfordshire with 112 stations on several routes. The Overground is highlighted in Orange on the Tube Map. The DLR and Jubilee Line can be connected from multiple Overground lines such as Stratford, Canada Water, and Shadwell. It’s also possible to join the Overground and travel to ExCeL London from Euston station. Some of the best views available with the capital’s most popular landmarks including Big Ben, the London Eye, the Tower of London, St. Paul’s Cathedral and The O2, traveling on a river boat service offers a truly unique perspective on London. The route is serviced by MBNA Thames Clippers; the Fastest and most frequent boat fleet on the river with departures form major London piers every 20 minutes. The UK’s first urban cable car, known as the Emirates Air Line, connects ExCeL London to the O2 and North Greenwich tube station. On the cable car, you can sit back, relax and enjoy stunning aerial views of London from 90 m above the river Thames. As an attendee or exhibitor for ICE 2017, a single fare for a cable car is just £2.50/per person. You will need to provide a badge or registration confirmation email.